Mornings are crazy around here. Crazy in the wake-up-two-kids-without-waking-the-other-two, kind of way. And sometimes I have to add my husband to that list, because he sleeps on the couch sometimes. There is a very bad joke that goes with that, super non-PC. I’ll save that for another day. So, while I’m hustling Kid 1 and Kid 2 out to school, I am thinking about what I’m going to serve the other two demons, who are always apparently starving when they wake up. They are bottomless pits, I swear it. Where does all the food go?! But I know that I have to get breakfast ready with the quickness, because they will kill me if they are not fed instantly. Say hello to my savior: Apple Cinnamon Muffins! 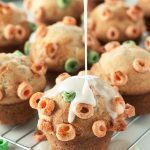 These are some fun little muffins, full of delicious fall flavors, and topped with one of the girls’ favorite cereal, Kellogg’s Apple Jacks! The batter comes together in literally less than 5 minutes, and then bakes for 15-20 minutes, so you have breakfast ready to eat in under 30 minutes! I say that is a huge win when you have busy weekday mornings. Also, it is a great way to use up those last few handfuls of Apple Jacks, you know what I’m talking about, just enough for maybe one person to eat, but no one else? There is nothing worse than kids bickering over the last bowl, so I tend to end up with like…four boxes of almost empty cereal on top of my fridge. Where do you keep your cereal? I’ve always kept mine on top of the fridge. No clue why. Anyone else do that too? 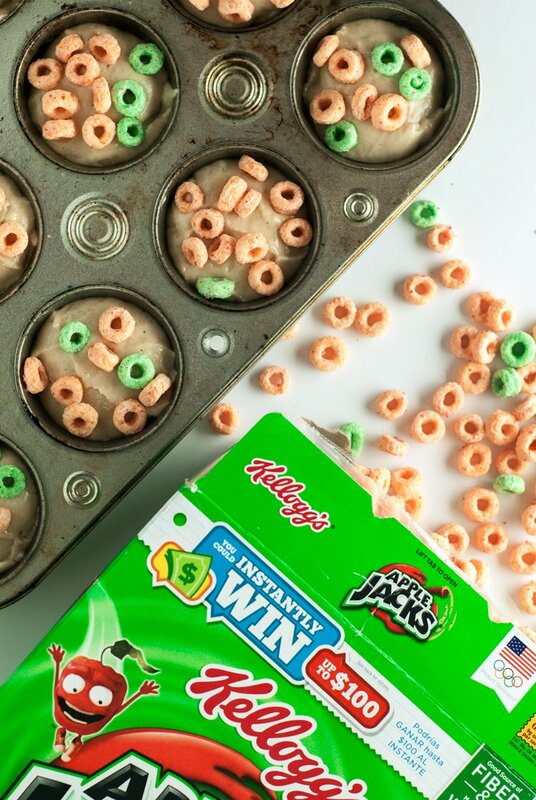 Now, when it comes to adding the Apple Jacks on top, be sure to press them down into the dough a little bit, otherwise they won’t stick and it will be a sad, sad day. 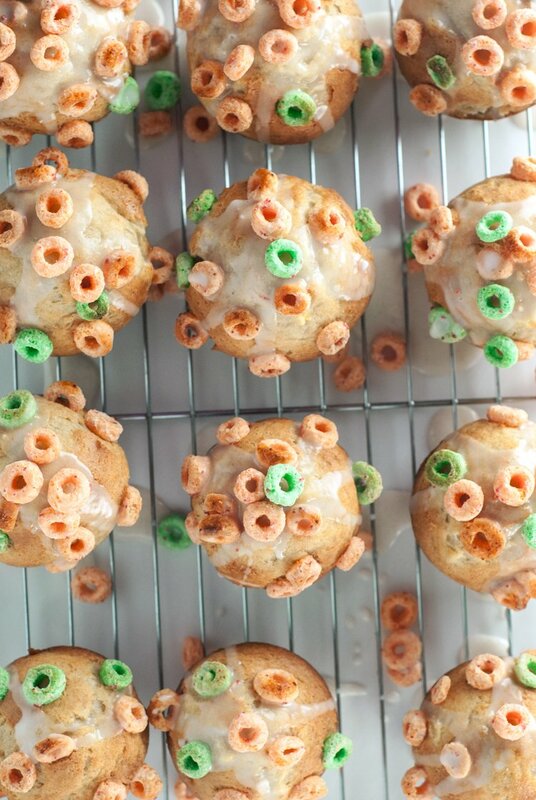 I also added more Apple Jacks after I glazed the muffins, because it’s fun, and because the muffins dome so much while baking that there is quite a bit of space that wasn’t there before they hit the oven. So have fun! Diiiid you know, from 9/13-9/19, if you purchase five select Nutri-Grain, Special K, Pop-Tart, and Kellogg’s cereal products you’ll receive a $5 Target giftcard! Hello, awesome! 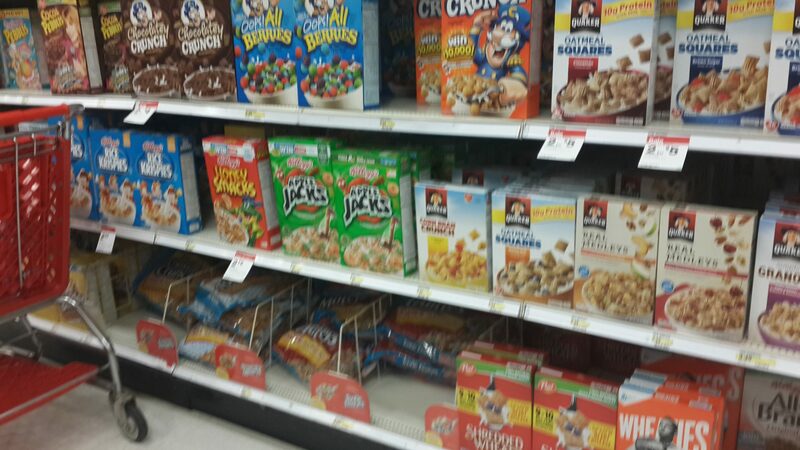 Now head on out and pick up your Apple Jacks and be sure to check out Kellogg’s Back to School packaging and great on-pack offers in store at Target! Preheat oven to 425 degrees. Line a 12 cup muffin pan with cupcake liners, or grease. Set aside. In a large mixing bowl, beat the eggs until combines, then add the sugar and mix until dissolved. Mix in the oil and vanilla until thoroughly combined. In a separate bowl, stir together the flour, cinnamon, nutmeg, salt, baking powder, and baking soda. 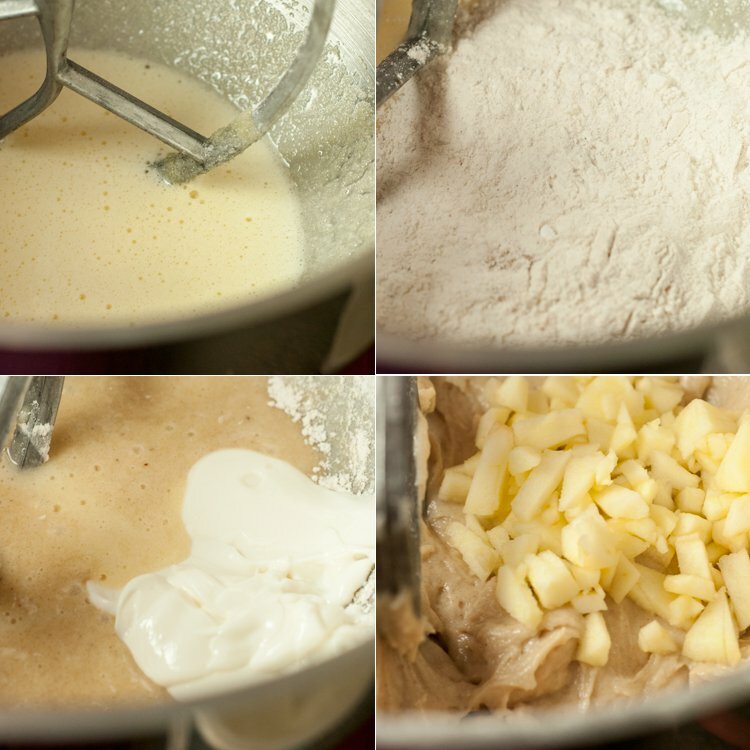 Add the flour mixture to the batter in batches, alternating with the greek yogurt, mixing until just combined. Gently stir in the diced apples, then divide the batter between 12 muffin cups. 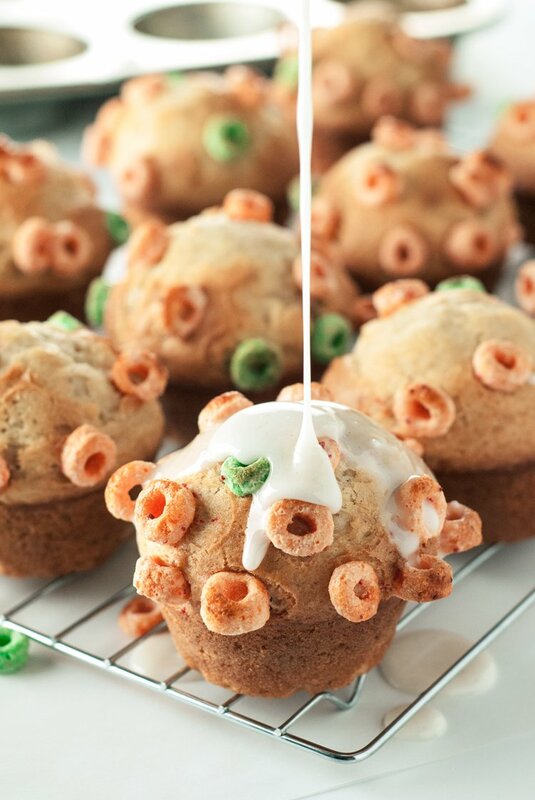 Press 1 cup's worth of Apple Jacks into the tops of the batter, then place in the oven and back for 15-20 minutes, or until the tops are golden brown and a toothpick inserted into the center of a muffin comes out clean. Remove muffins from tin, then mix together the powdered sugar, milk, and cinnamon and pour over muffins. 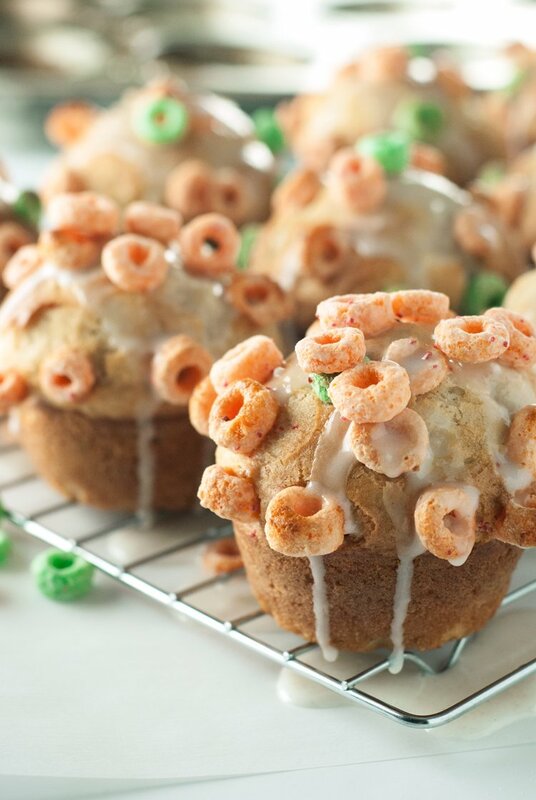 Top with the remaining cup of Apple Jacks and enjoy!